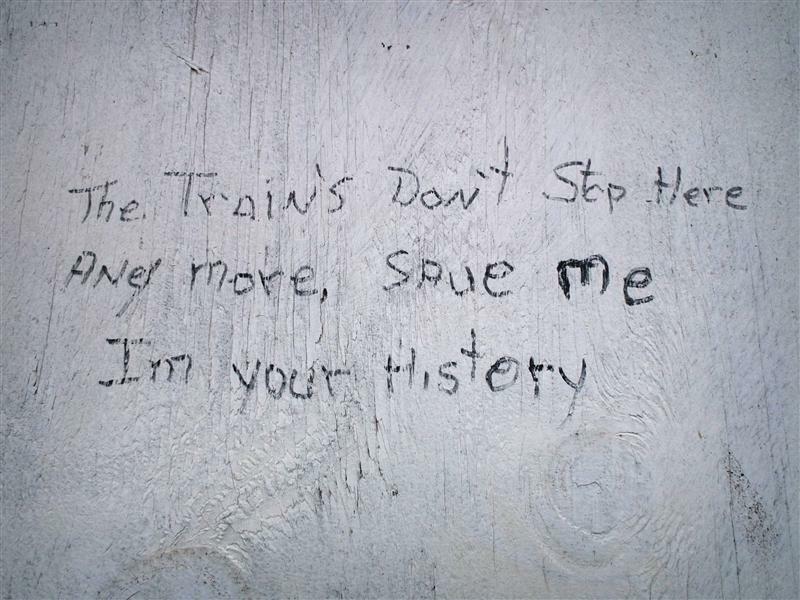 The trains don’t stop here any more – save me, I’m your history. Hidden away in a nearly-forgotten corner of my computer’s almost-full hard drive are a few photos that were never meant to see the light of day. They were dark, and the day was rainy, and they were downright horrible. But a bit of graffiti scrawled on the side of the station that I remembered photographing always sat in the back of my mind. 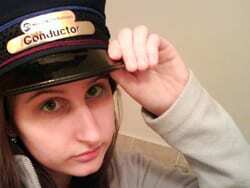 It read, “The trains don’t stop here any more. Save me, I’m your history.” A news article that was sent to me today (thanks, Jeff!) led me to dig out those photos. The station on which the graffiti was written is Millwood – once part of the long-gone Putnam Division. Hardly in spectacular condition (but certainly not the worst), the status of the building has been in limbo for quite a while. Again the station finds itself in the news, as a demolition permit has been applied for. 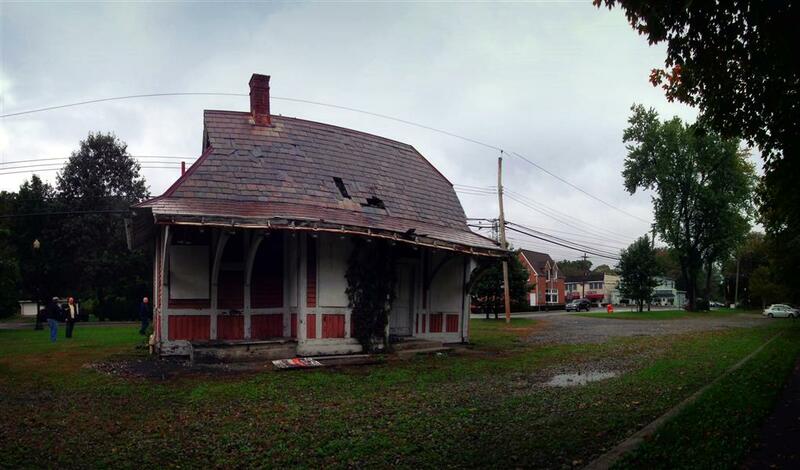 Though tearing down this historical building would be sad, I find it laughable that the article mentions a proposal for making a replica of the station. Why not save the real thing, while it is still here? take control of the station and take care of it. was turned into a Real Estate office,if memory serves. Yeah, I think Lincolndale is still around, so is Lake Mahopac, which is what… the VFW hall now? it was a station at one time. Millwood when trains were running. True. As has Briarcliff Manor… though it is pretty attractive now. Is Elmsford still around? porch(see B/W photo,pg 76,THE PUTNAM DIVISION). Lincolndale was definitely still around a couple of years ago http://www.roadandrailpictures.com/rnylinco.htm and was one of those places where after I took my pictures someone came out to ask me what I was doing. I’m pretty sure Elmsford is still there. I passed a building in Elmsford last year that sure looked like an old station and seemed like it would back up to the old RoW (I didn’t photograph it yet though). I heard that Millwood was leveled on wed, may 9th. can build a proper replacement. Because saving the real thing, and a piece of history is too much work. Thought I commented on this last night… guess I didn’t. Yeah, Torrington is really too bad. Torrington in general just seems like a craphole though. At least the people in Canaan had the right idea. After that fire, I didn’t think that place was ever going to come back (the kids that started the fire should have been forced to help rebuild it, hah!). It was certainly a lot of work to get it to the state it is in now – Millwood however, is in great condition compared to that!